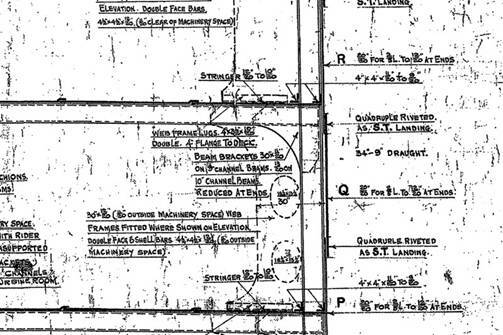 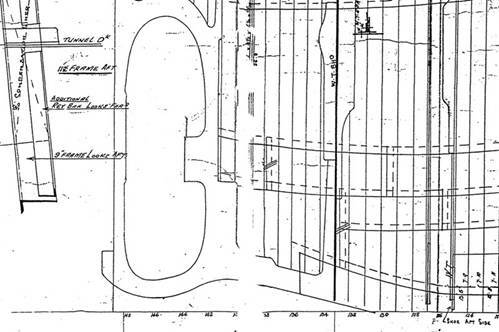 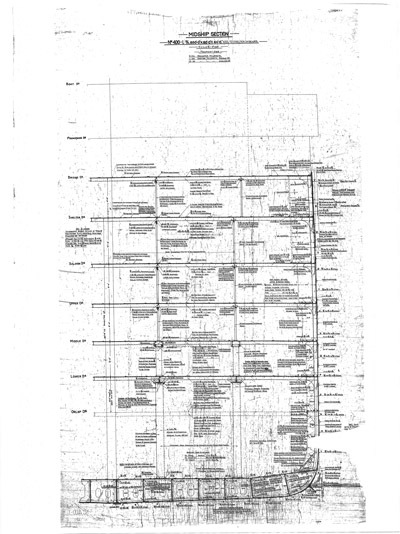 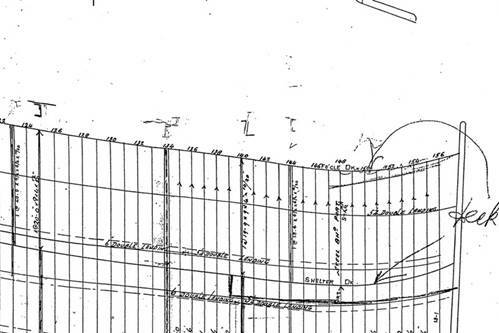 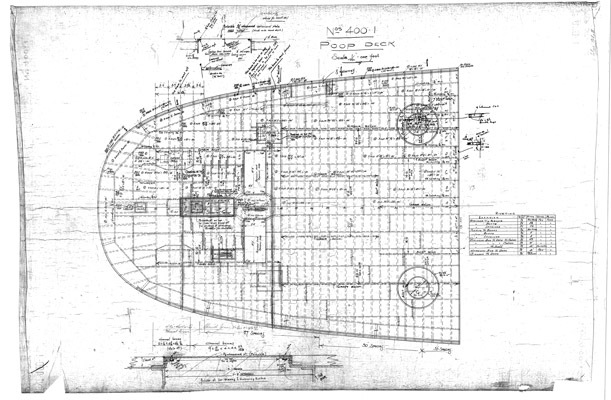 On this page I show you some of the original plans of Titanic und Olympic as well as of the third sister the Britannic, that were used to create the Hahn Titanic CAD plans. 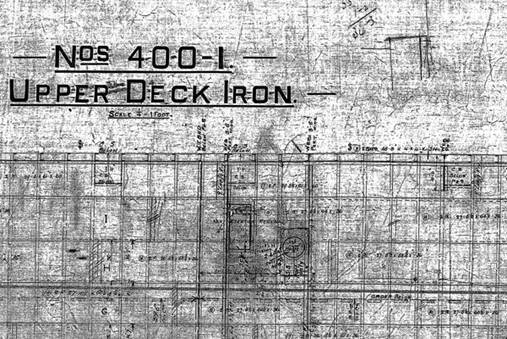 But you should know that most of the plans show the Olympic as planned and many changes and additions that made Titanic unique never find their way back into the plans. 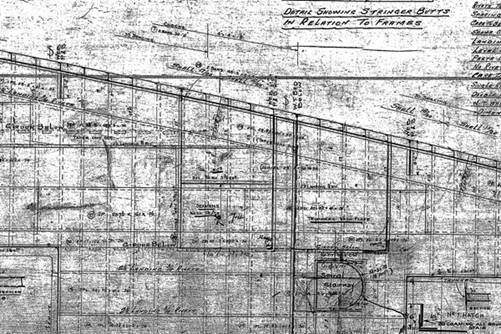 Therefore the original plans were necessary as a base for creating the CAD plans and a continuous verifying of the plans against pictures and wrack footage was unavoidable, to show Titanic in my plans as she sailed on her final voyage. 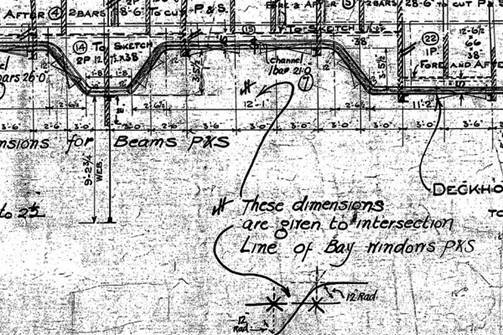 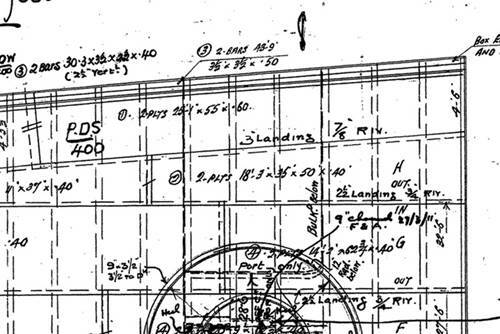 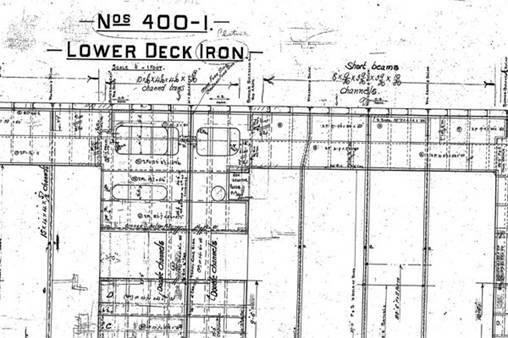 Anyway the plans are very interesting because of many handwritten comments and additions like the screen on A-deck or the change of the wheel house on the bridge. 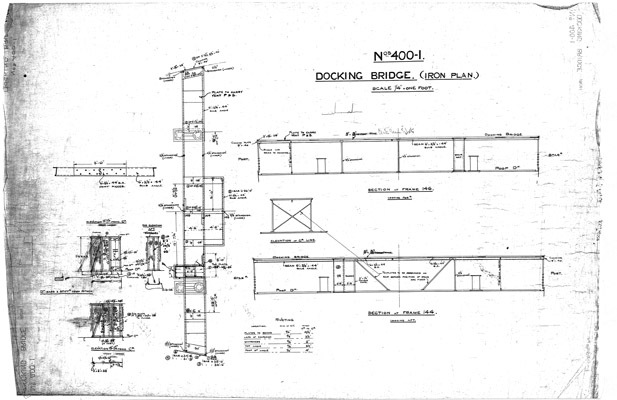 The plans are first shown in total supplemented with two detail views. 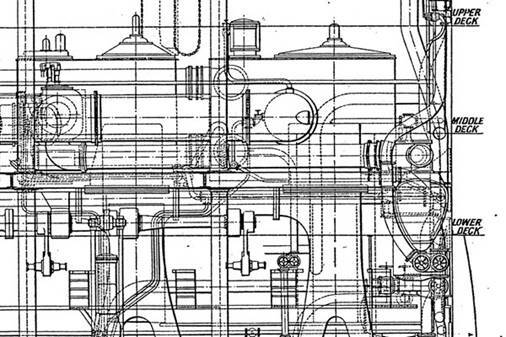 Most of the plans are in the scale 1:48. 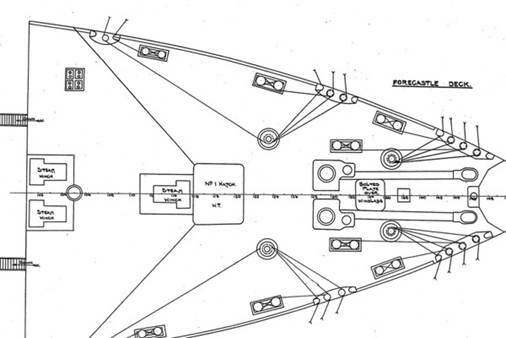 This affects mainly the deck plans, the shell plating plan and the lines plan. 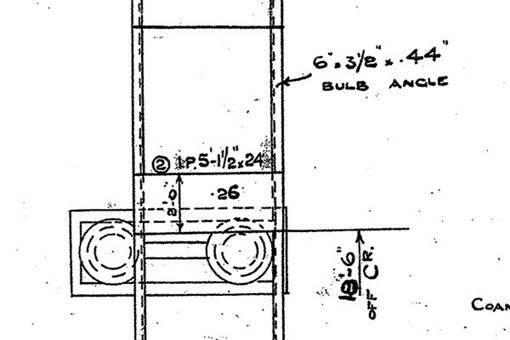 These have in real a length of 6 to 7 meter. 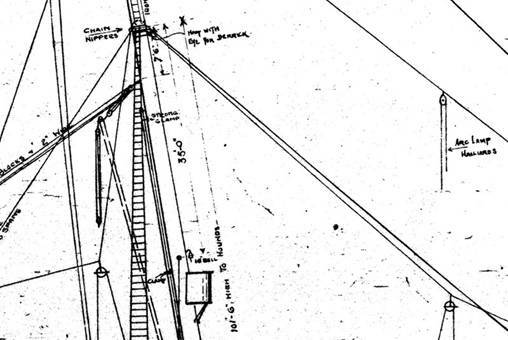 Der Rigging Plan zeigt im Wesentlichen die Takelung der Titanic. 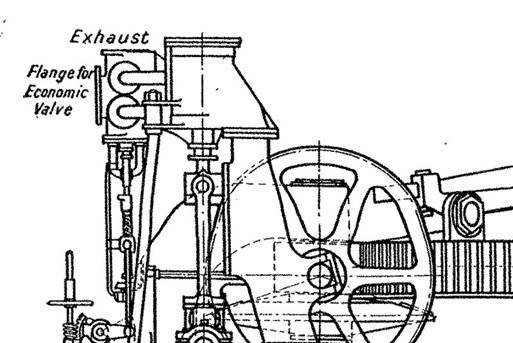 Er ist im Maßstab 1:144 gehalten. 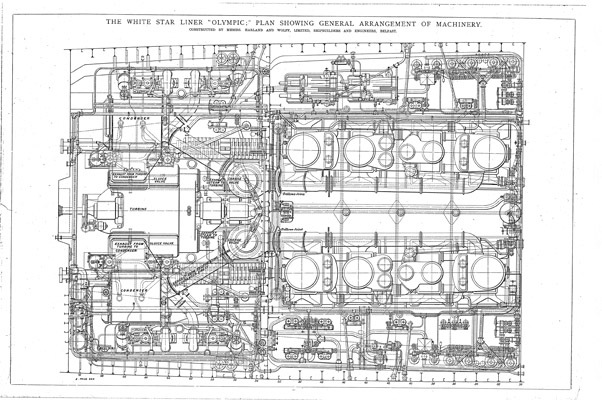 Very interesting plan of Olympic after the sinking with the whole boat deck full of lifeboats. 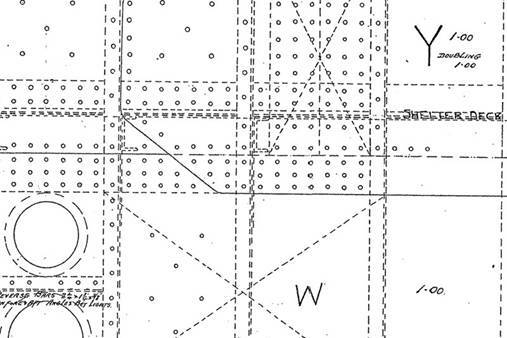 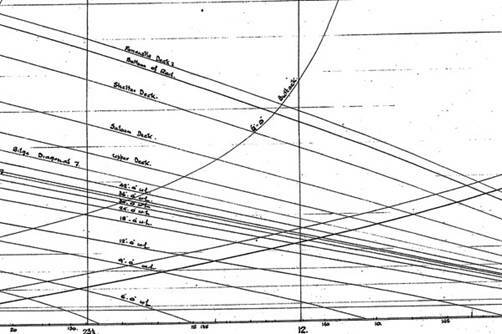 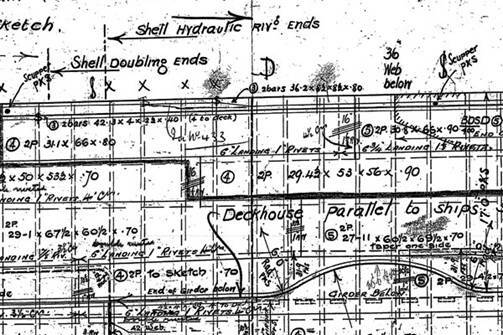 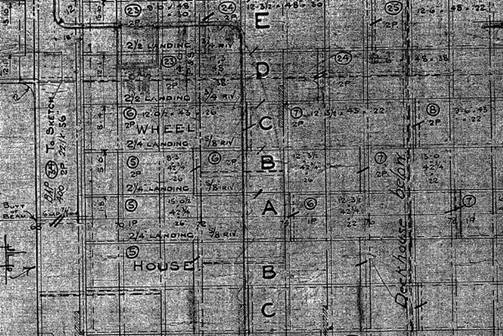 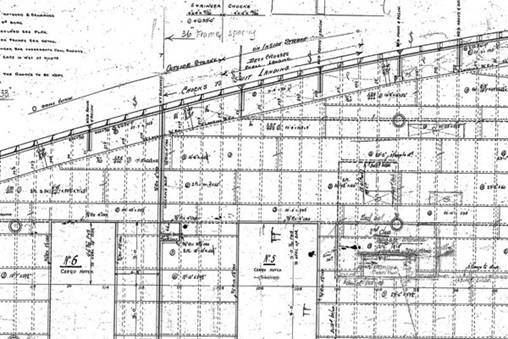 Plan is drawn in 1:144. 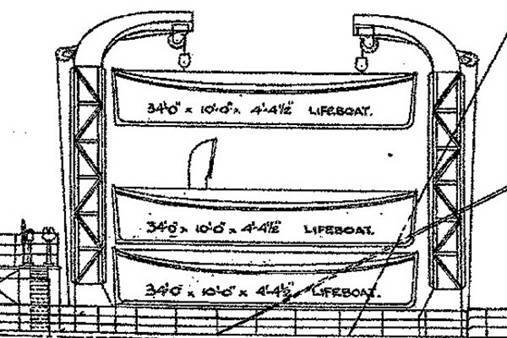 The plan in 1:48 shows the boat deck of both liners with the outline of the deck houses. 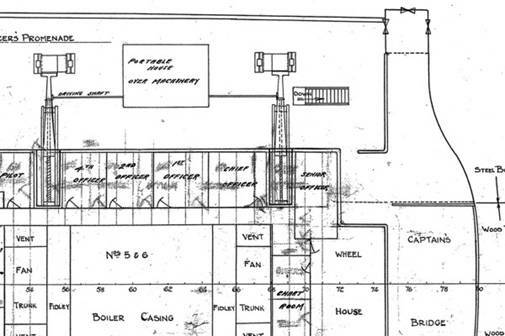 Interesting is the change handwritten of the wheel house, which was not adopted the way for Titanic as drawn. 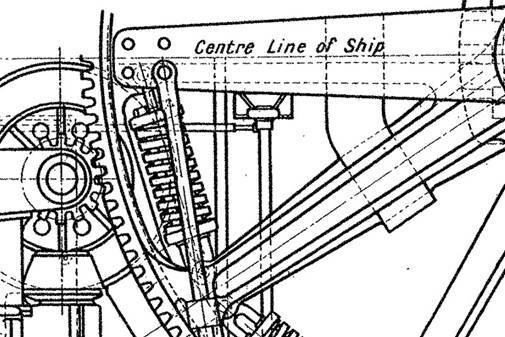 The wheel house of the Olympic was curved and now direct view from nock to nock was possible. 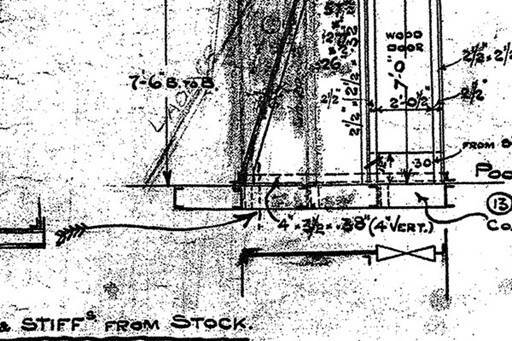 On Titanic the front was changed to straight. 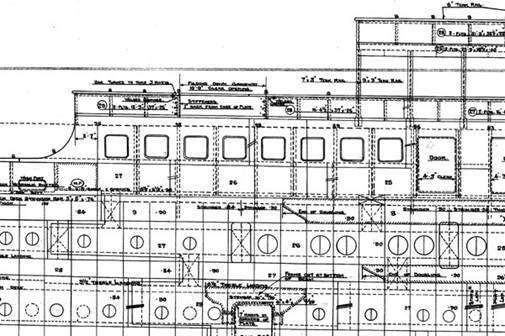 This plan in 1:48 shows pretty nice the arrangement of the windows on A-deck. 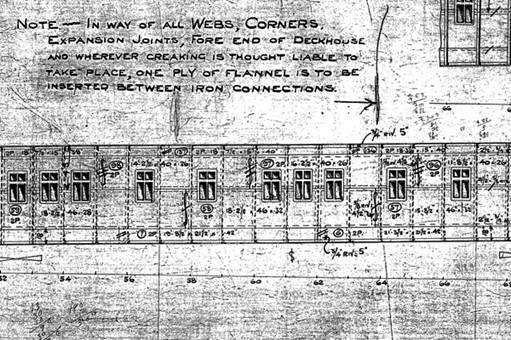 It has also many neat comments and changes for Titanic like the handwritten change to the screen outside A-deck which was decided very short before her departure from Belfast to Southampton. 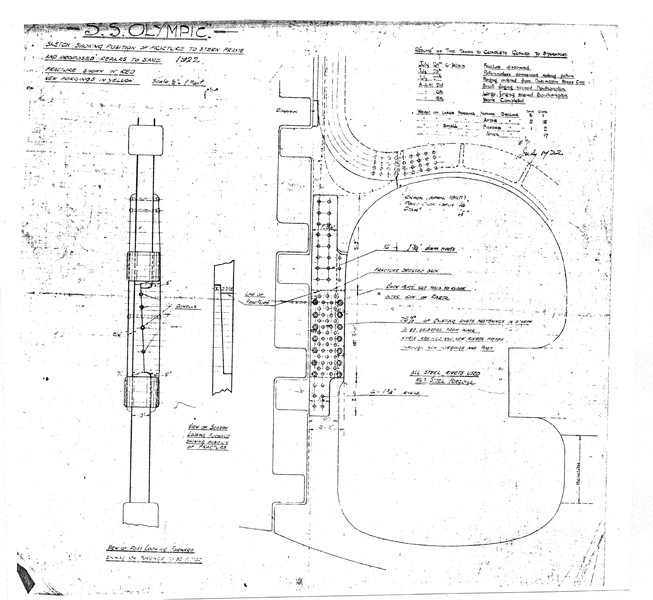 Here A-deck is shown in 1:48 with all plating and cut-outs fort he boiler. 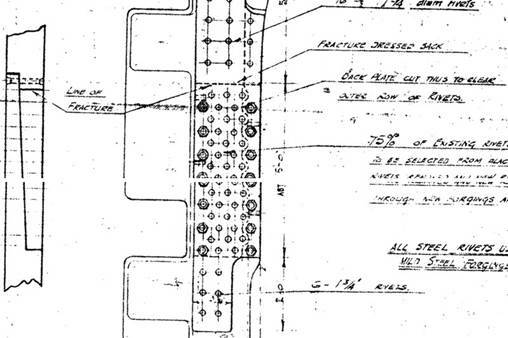 Interesting are the details for the expansion joint. 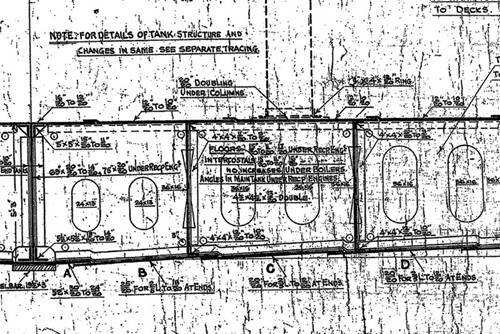 This plan shows B-deck plating in 1:48. 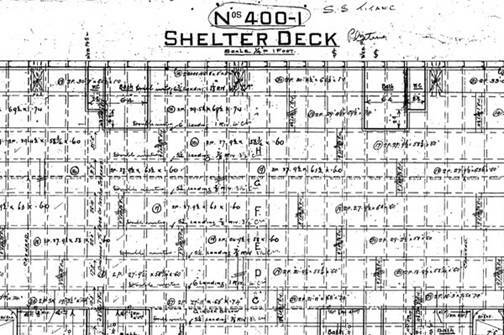 The shelter deck or C-deck was the first to run the whole length of the ship. 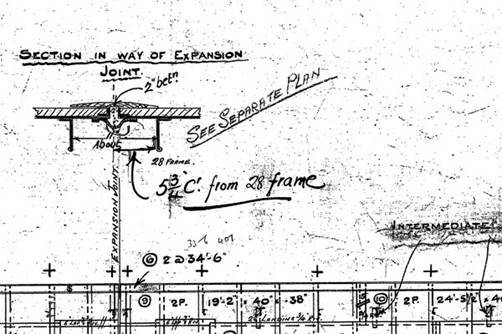 This plan is also in 1:48 and very long. 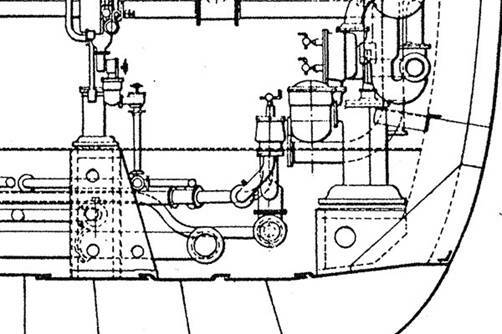 At the Lower deck you see many big cut outs fort he boilers and the machinery. 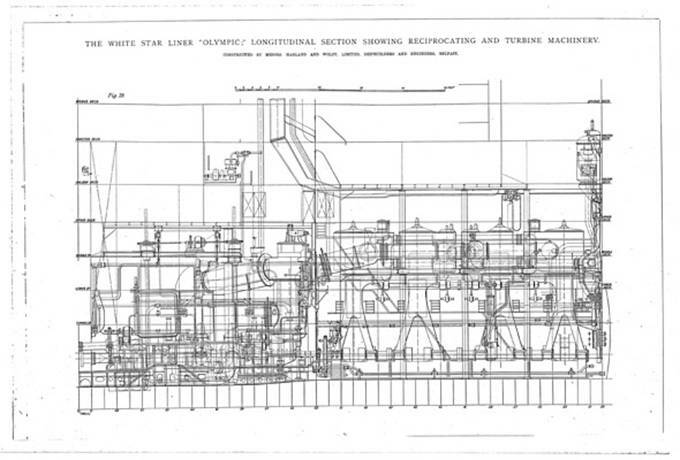 It is drawn in 1:48 and shows the deck only a bit over the middle line of the ship. 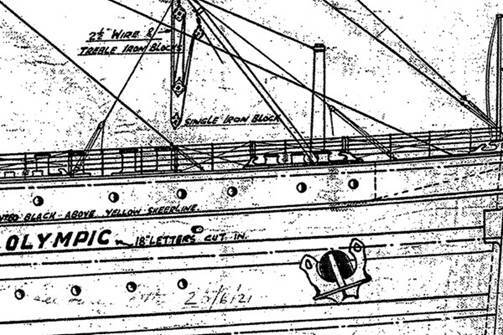 The Poop deck was the part of the ship where most of the remaining passengers crowded, before the ship went down. 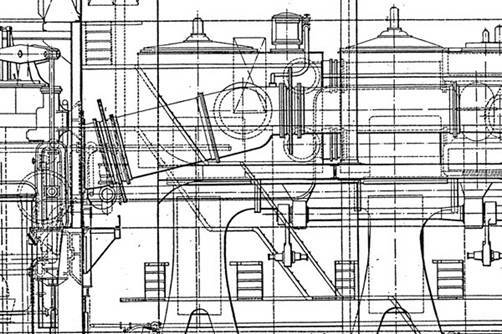 The plan is drawn in 1:48 and shows the openings for the steering machine as well as the position of the docking bridge and the cranes. 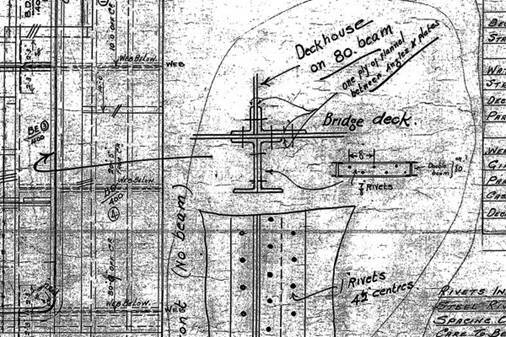 The docking bridge which stood on the Poop deck is drawn in 1:48. 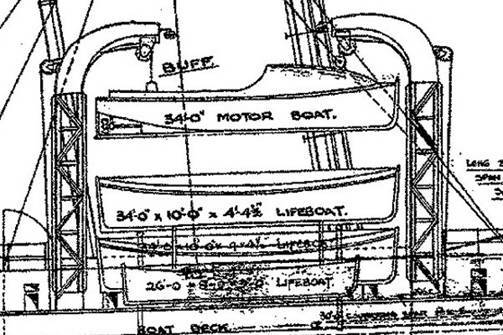 The lines plan is one of the most important plans and shows in 1:48 the shape of the hull as well as the frame set of both liners. 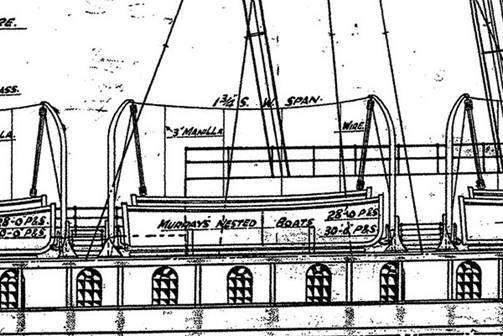 The style is a bit confusing as it shows the fore and rear part of the ship moved in one of the other. 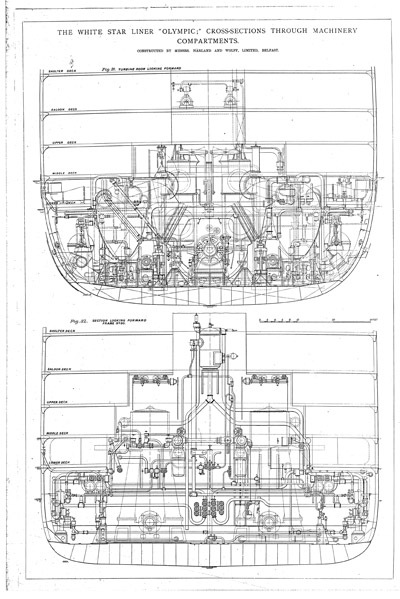 This plan in 1:48 is also one of the most important as it shows the arrangement of the plating with all the rivet lines and doubler plates and the portholes for both sides. 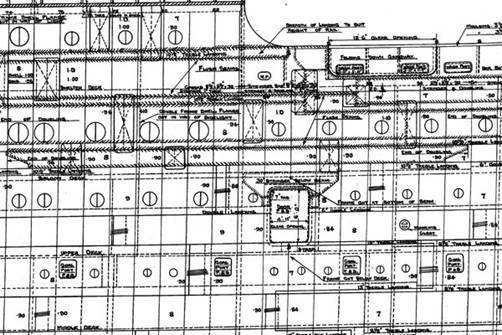 But one must know that the plan is only 95 % correct with Titanic and had to be checked back with photographs of Titanic during fitting out. 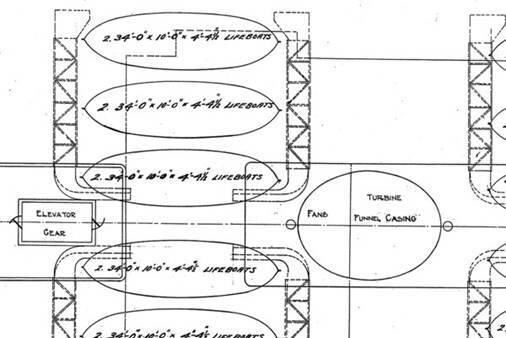 The style of the plan is interesting because it shows the complete shell including the bottom plating. 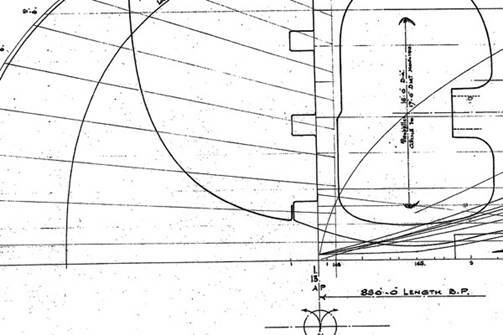 This is the reason why the bilge keel is shown much to high. 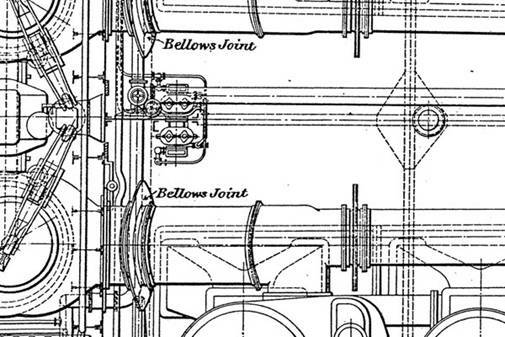 The rear frames in detail with the wings is shown in this plan in 1:48. 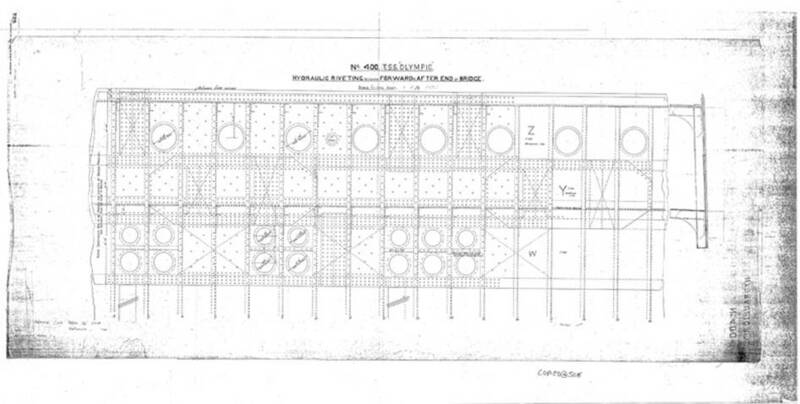 It was very useful for Titanic and Olympic because the double hull of Britannic, which was constructed after the sinking of Titanic, was only between the well decks. 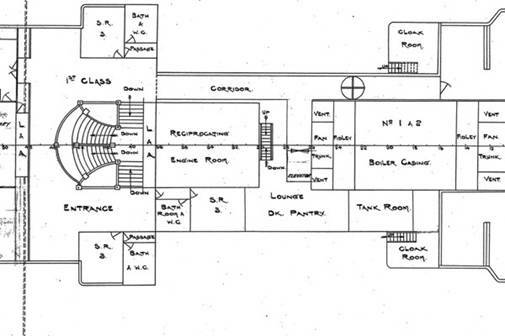 This plan shows the main frame or midship frame in 1:48 with all decks and pillars. 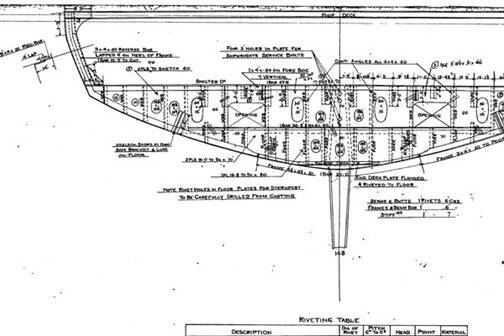 The upper part of the hull was riveted hydraulically. 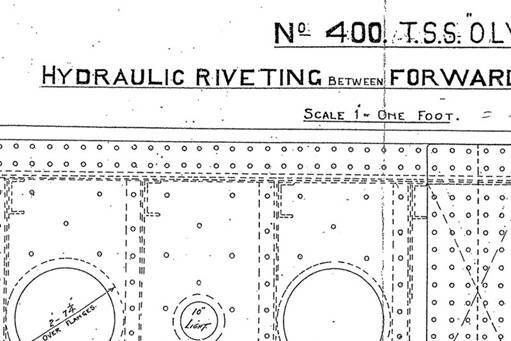 These rivets were the only ones which were clearly visible because they had a round head. 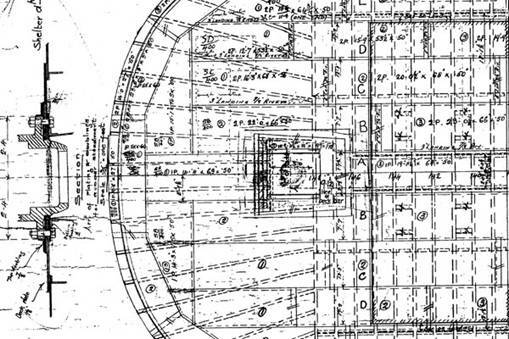 This plan shows the riveting only of a small part of the shell but the pattern is visible which can be adapted to the rest of the hull. 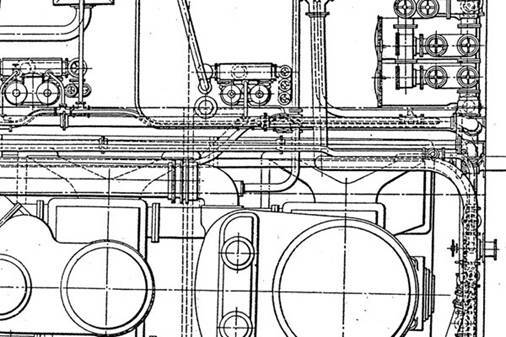 The steering machine worked with two little steam engines of which one was only a back up. 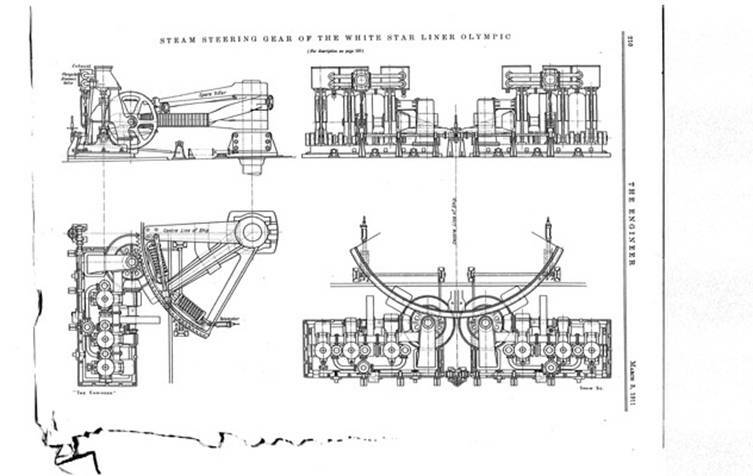 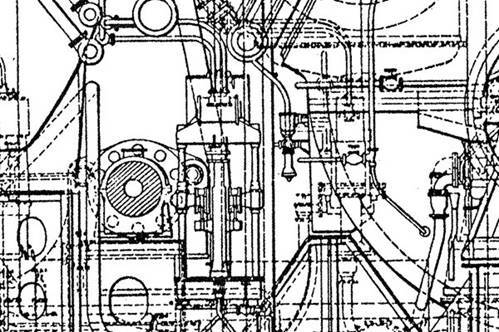 The following three plans of Titanic’s machinery look quite similar as the ones which were published 1911 in the shipbuilder magazine, though they have much more detail. 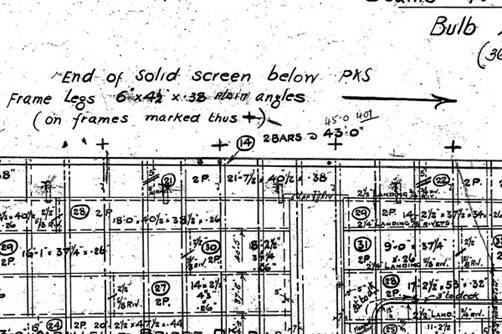 The framing plan shows the length of the single frames. 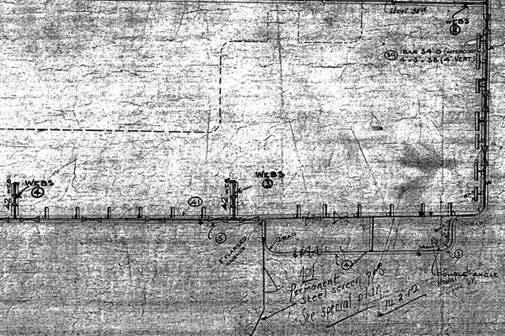 For the CAD plan this wasn’t necessary but from an engineering point of view it is an interesting plan, drawn in 1:48 with many neat details. 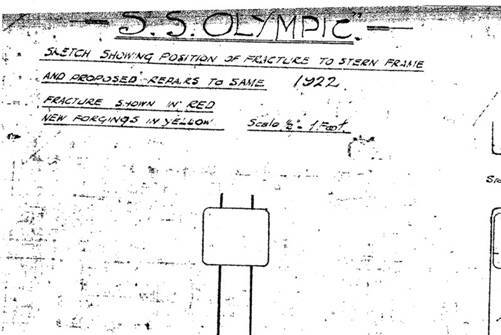 In 1922, Olympic needed a repair of the stern stem because of a crack. 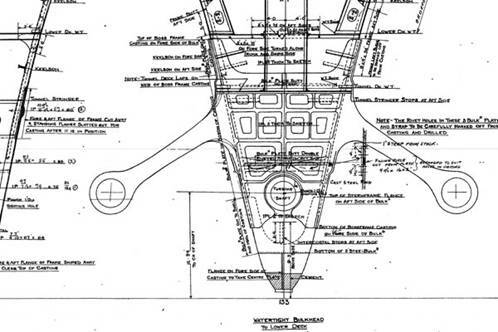 This plan shows pretty nice the shape of the stem and the lines of rivets. 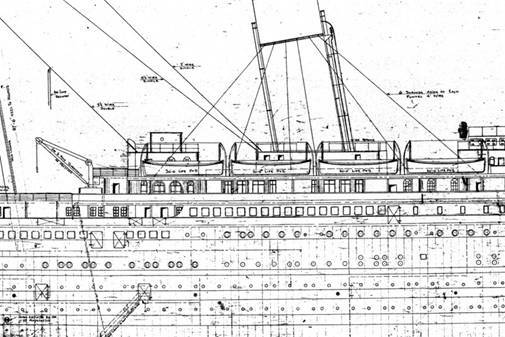 Even if not useable fort he Titanic CAD plans, the plans of Britannic are very interesting because they show her as a hospital ship with the huge gantry davits. 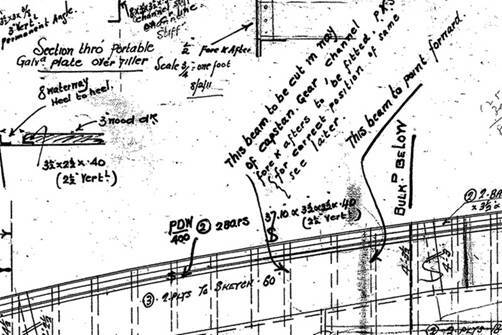 If you have any further question, do not hesitate to send me an email.